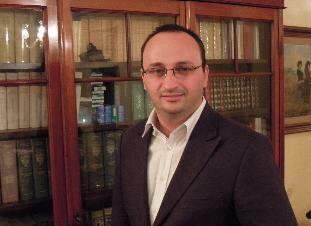 Alessandro Canali has been a practicing attorney in Rome since 2002, specializing in civil and administrative law. Alessandro also works extensively in consulting and providing legal assistance to foreign companies with offices and branches in Italy, with special emphasis on American businesses and universities. He is currently the coordinator of legal affairs for the 5-Star Movement in the Lazio regional government. To read more about Alessandro’s legal and political work with the 5-Star Movement, click here. Alessandro received his law degree from La Sapienza University in Rome in November 1998. He completed his two years of legal apprenticeship (pratica, required by the Italian Bar Association) from 1999-2001 at the Perugini law firm in Rome. In 2001 he passed the Italian Bar Exam on the first attempt, at a time when approximately 80% of candidates in Rome were rejected at each exam (held annually in two parts, written and oral). Mr. Canali holds a qualification to teach the subjects of law and economics in Italian high schools and institutes of higher education. In the course of his teaching career, he conducted more than 1,000 classroom hours of lectures on various legal topics. Mr Canali is currently licensed by the Washington State Bar Association to practice as a foreign law consultant in Washington State, where his international law consulting firm is based. He is a past president of Informat Education Institute, a non-profit organization recognized by the regional government of Lazio, and a past president and founding member of the Italian-American Chamber of Commerce of the Pacific Northwest. Speaker at the Educational Law Association annual convention held in Vancouver, B.C. Became licensed as a Foreign Law Consultant with the Washington State Bar Association, member of the International Practice Section, which permits limited legal practice in Washington State.